There is no known cure for the viruses that cause the common cold and influenza. When you do get sick with a cold, according to the U.S. Centers for Disease Control and Prevention (CDC), the two top things you can do to feel better are: 1. Get lots of rest and 2. Drink plenty of fluids. Soup broth will help keep you hydrated and can soothe some of the discomforts that may prevent you from sleeping. Feeling run-down is one of the primary symptoms of cold and flu. That can make taking care of yourself by eating nutritious meals very difficult. Keep your pantry stocked with plenty of dried soup so you can make fast meals that will help you feel better fast. Our Dried Gourmet Soup Mixes and Blends are incredibly easy to make. Simply add water, heat, and eat. Because there is no cure for cold and flu, prevention is truly the best medicine. During the winter season when you are indoors with coughing, sneezing friends, family, and co-workers, you are likely to be exposed to some cold and flu viruses. The best way to prevent cold and flu is to wash your hands regularly. The CDC also recommends that everyone over six months old get an annual flu vaccination. For both cold and flu, boosting your immune system is a smart second line of defense. Medical experts agree that healthier eating supports optimal immune system function, so your body does a better job of fighting off viruses that can make us sick. There are many products on store shelves that claim to improve the function of your immune system, but there is little scientific evidence to support those claims. Though pills and potions may not turn your immune system into a magical shield that will keep all viruses and bacterial infections at bay, medical experts agree that maintaining healthy lifestyle habits can help prevent illness by boosting immune system function. A post published by Harvard Medical School suggests that eating “a diet high in fruits, vegetables, and whole grains, and low in saturated fat” is one of several “healthy-living strategies” that support immune system function. Other healthy-living strategies include getting regular exercise and plenty of sleep. All Harmony House dehydrated soups make it easy to maintain a diet rich in whole foods, including vegetables, beans, and legumes. Our incredibly popular dried Vegetable Soup Mix contains a variety of dehydrated vegetables and herbs, including minced carrots, onions, tomatoes, peas, celery, green bell peppers, green beans, and parsley. 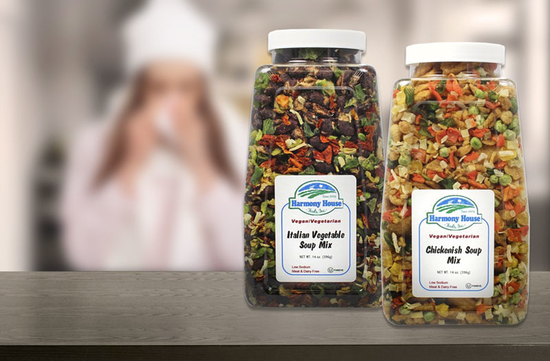 Our dehydrated Vegetable Soup mix, like all our all-natural dried soup mixes is also vegan, gluten free, Kosher, pesticide free, MSG and additive free, and non-GMO. One of the most enduring and popular old folk remedies for easing cold and flu symptoms is to eat chicken soup. For vegans, vegetarians, or those who are simply trying to follow a mostly vegetable based diet, we offer plenty of meat free alternatives. If you want a vegetarian alternative, try our Garden Veggie Chickenish Soup (one of our gourmet dried soup blends). Our Chickenish Soup is made with flavored textured vegetable protein along with dehydrated diced potatoes, green peas, carrots, sweet corn, green beans, and onions. Our vegan dehydrated soup options provide a quick, nourishing meal to ease your symptoms and fuel your immune system so you can get you up and back on your feet as quickly as possible. Try our Value Soup Variety Pack to stock your pantry with 12 of our dried vegan soup varieties, including Garden Veggie Chickenish Soup. Trying to decide between a Harmony House Soup and Chili Mix or Blend Sampler, Variety Pack, or Pantry Stuffer? Take a look at the Harmony House Soup Comparison Chart to see a side-by-side comparison of each package type we offer. Get the Harmony House Dried Soup Comparison Chart Here.